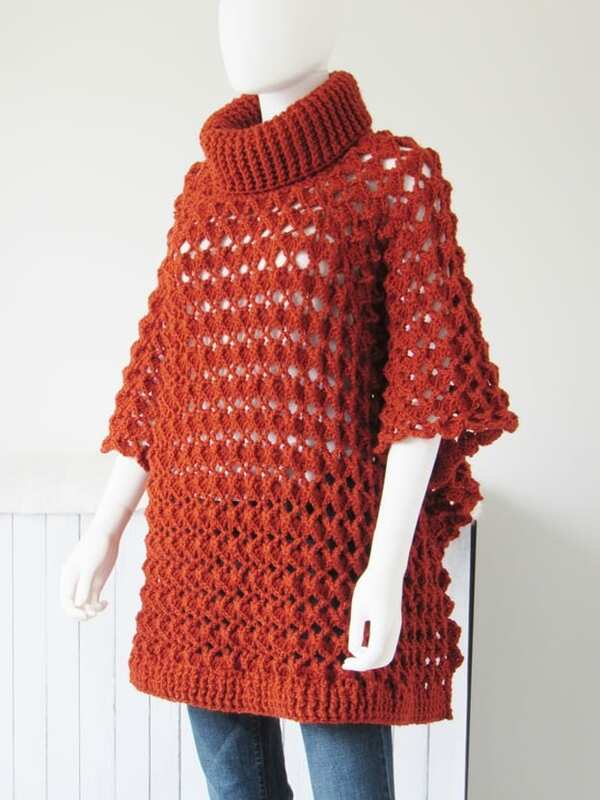 If you have been looking for a stunning how to crochet a poncho pattern, your search ends here. Okay, that was way too cheesy, sorry! 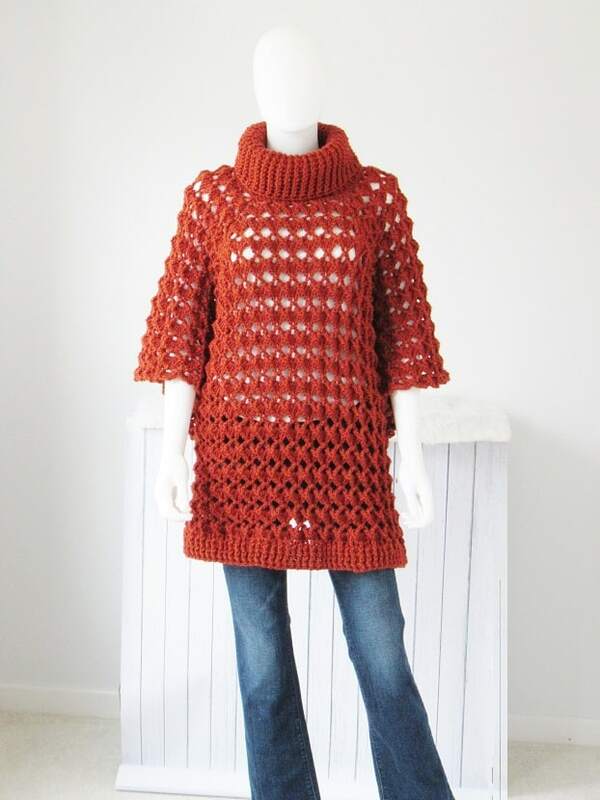 I really hope you will love this free crochet pattern though :). I am super excited to publish this pattern as this would be my very first free clothing pattern. I designed this in response to the requests I got from my blog readers which makes it even more special. 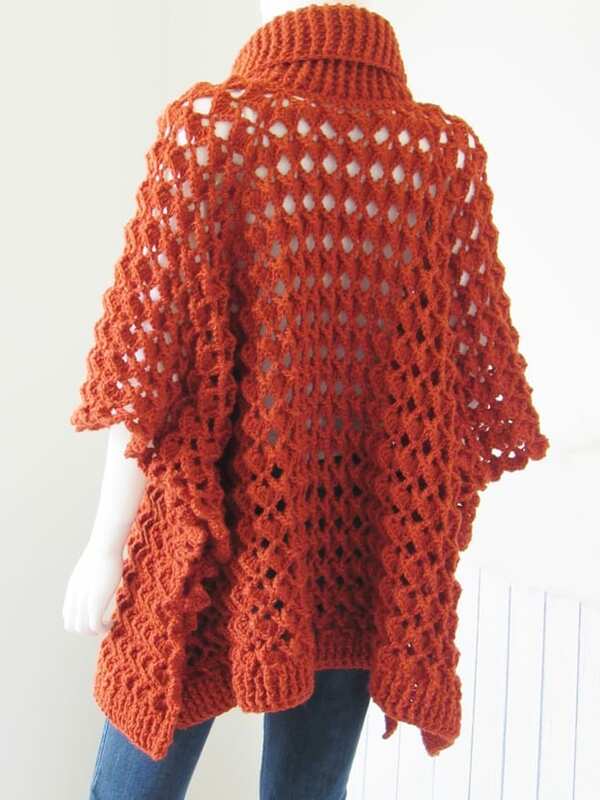 This crochet poncho is designed with the same stitch I used for my Falling Petals Afghan, Rose Petals Scarf and Sea Shells Cowl. I might as well design another afghan where the same stitch is worked in the round. I had initially intended to make this a triangle poncho but I didn’t quite like how short it turned out. So, I decided to add extensions to the front and the back and turn it into a Kaftan style poncho. I hope you like the result. Enjoy the free pattern. You can work from the written pattern below or purchase an Ad-free PDF for just $2.99 here. Worsted weight yarn. 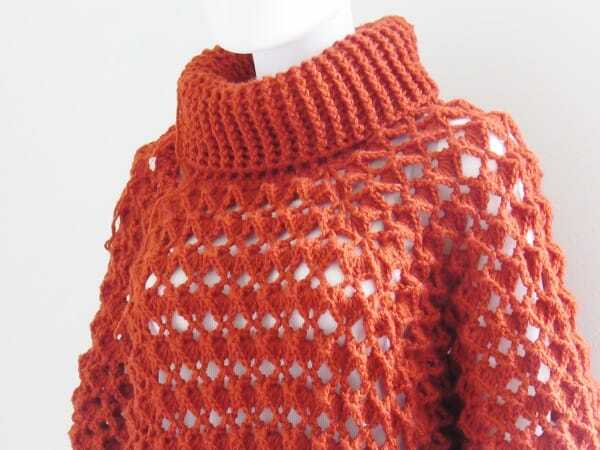 The sample poncho was made using Sprightly Acrylic Wool Worsted yarn in color Flame. Size Small(S): 25 inches long and 31 1/2 inches wide when laid flat. Size Medium and Large (M/L): 26 inches long and 35 1/2 inches wide when laid flat. 10 skeins of Sprightly Acrylic Wool Worsted yarn of 216 yards each. V st: (1 dc, ch 2, 1 dc) worked into the same st. Shell St worked into a V-st: 1 fpdc in the first dc (first leg of the V-st), (3 dc, ch 2, 3dc) into ch-2 space of the V-st, 1 fpdc in the next dc ( second leg of the V-st). Front post double crochet (fpdc) and Back Post double crochet(bpdc): You can see a tutorial here. 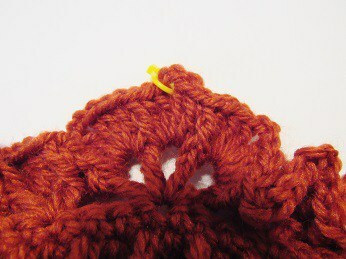 Repeat Row 3 until your ribbing is around 8 1/4 inches high. You can make it as tall or as short as you want it to be. The choice is yours. 1. 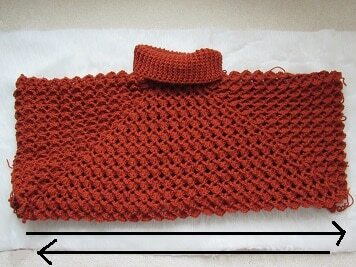 The body of the poncho will now be worked around the neck in a square shape with 4 corners. 2. The body is worked on the wrong side of the ribbed neck. 3. Every time the pattern says to move the marker up, move the marker from the previous ch-2 space to the ch-2 space you just made. The markers indicate the 4 corners. Note: After every 4 V-sts, you will make a corner formed by a (V-st, ch 2 and a V-st) in the same st. 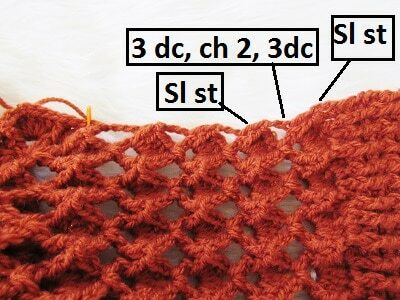 Note: If you have worked any of my other patterns with the same stitch, kindly be advised that the shell in this pattern include the 2 fpdc sts on either side. See stitch explanation for details. Row 3: Sl st to the next ch-2 space, ch 3, 2 dc, ch 2, 3 dc in same ch-2 space, 1 fpdc in next dc, (2 dc, ch 2, 2 dc) all in the marked ch-2 space, move the marker up into the ch-2 between the dc. Repeat Rows 7 and 8 until you have completed a total of 23 rounds for size Small and 25 rounds for sizes Medium/Large. You will end in a shell round, fasten off. Every time you repeat Rows 7 and 8 you will add 8 shells and 8 V-sts respectively. For example, Row 9 will end in 48 shells and Row 10 will end in 56 V-sts. At end of Round 23 you will have 104 shells around and at end of Round 25, you will have 112 shells around not including the marked corners. 1. Now you will stop working in the round and add an extension to the front and the back. 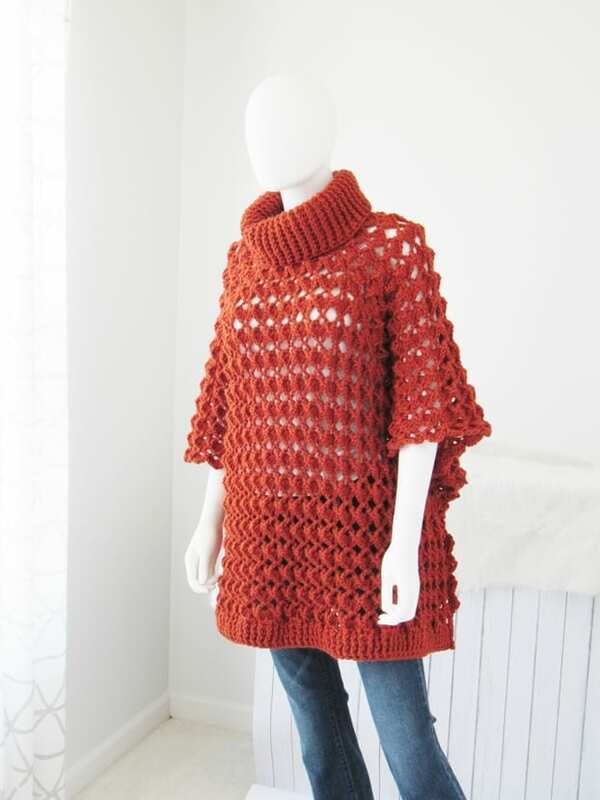 That way, your poncho will increase in length while the width stays the same. 2. 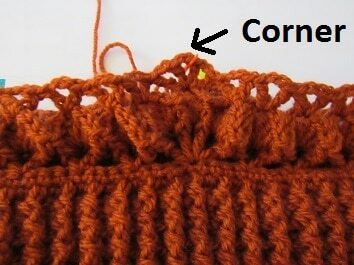 Stitch counts for bigger sizes are given in the order Small(Medium/Large). Repeat rows 2 and 3 until you have added a total of 4 shell rows. Row 2: Ch 3, * (1 fpdc in next fpdc, 1 bpdc in next bpdc), repeat from * to last st, 1 dc in last st, turn. Repeat Row 2 until your ribbing is 2 inches wide. Fasten off. Now you will add shells to the sides to make the edges of the poncho look more uniform. 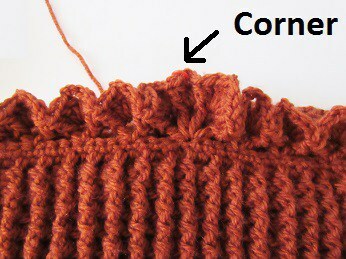 The shells will start only from the top of the bottom ribbing. Right side: Sl st to the top of the ribbing and work upwards, *( 3dc, ch 2, 3dc) all into the next big ch-space, sl st to the side of the shell, repeat from * 2 more times, (3dc, ch 3, 3dc) in the last big ch-space, 1 sc in the marked ch-2 space, sl st in the next 2 sts, fasten off. Left side: Sl st 2 sts before the marked st on the side of the poncho, sl st in next st, sl st into marked ch-2 space, *( 3dc, ch 2, 3dc) all into the next big ch-space, sl st to the side of the shell, repeat from * 2 more times, (3dc, ch 3, 3dc) in the last big ch-space, sl st to the top of the ribbing, fasten off. Repeat the same steps to extend the back of your poncho and add the bottom ribbing. 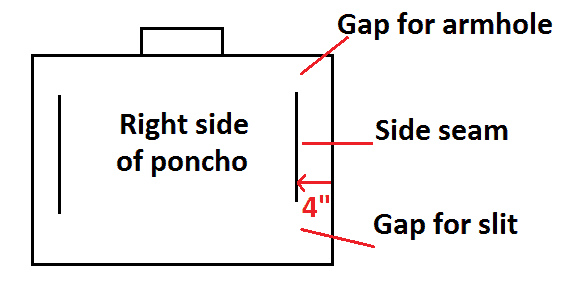 The poncho is sewn on the right side to form the armholes and the slits. Fold the poncho at the neck, align the sides and bottom, sew 4 inches away from the side edges leaving a 7 1/2 inch gap for the armhole at the top and another 7 1/2 inches for the side slits at the bottom. If you love this stitch, check out my crochet afghan, crochet scarf and crochet cowl made in the same st.
You can find more free patterns on Allfreecrochet.com. Signup for their newsletter here. This poncho is beautiful. I live in the south and sometimes a regular heavy poncho is just too much. This one is perfect for our up and down temps in the spring, summer and fall. It certainly was well worth the wait. I don’t blog. Don’t even know how, so I rely on emails like this. Thank you for this. Hi Karen, I am so glad you like it. Thank you for visiting my blog. Yay! Thank you, Nora. I am really glad you like it. Thanks for all you so generously share! Hi April, You can make the ribbing 3/4 inches tall and then work around it. It should give you something like a crew neck. I hope that helps. Let me know how it goes. This is gorgeous! I can’t wait to try. This year I have challenged myself to both design my own patterns and broaden my horizons by trying to finish patterns by others designers. Usually I give up on other designers patterns when I hit a snag and just redesign to my liking. However that doesn’t teach me new skills. Thanks so much for sharing this really really pretty Pattern. Hi Tracy, I am really happy you like this pattern. I wish you the best with your designing adventures. It is so much fun! Perfect! 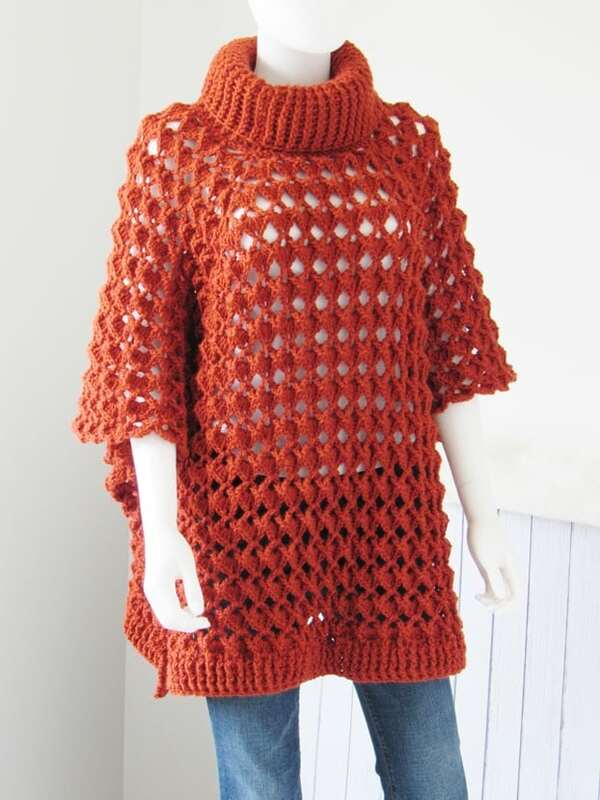 A fashionable, quick poncho Great for me, my daughter and my Up and coming fashion-forward granddaughter! Thank you for sharing! Hi Suzanne, I am really glad you like it and I am excited to hear that you will be making three of them. Please tag me on Facebook or Instagram, #crochetdreamz. I would love to see it. This is gorgeous; and so different! Love the shape and can’t wait to try it. Thank you for being so generous with your talent. Hi Emma, thank you for your kind words. I love being part of this huge crochet family. Greetings from snowy Minnesota! 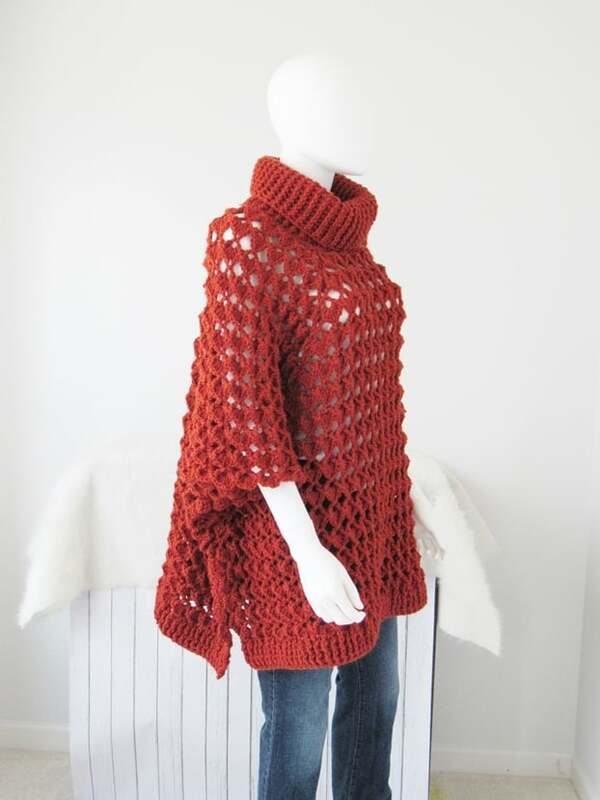 I am in love with this poncho (as well as all of your other patterns I’ve seen). 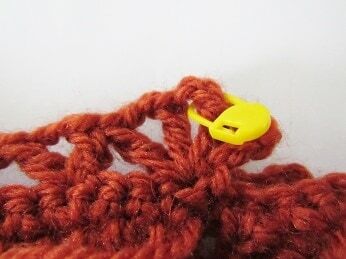 I’m a pretty seasoned crocheter, but I’m stumped on Row 3 on your note that the shell of the pattern includes the fpdc stitches ON EITHER SIDE. I tried to hit your tutorial, but it’s gone. I understand fpdc and bpdc, but this little note confused me. Can you help? 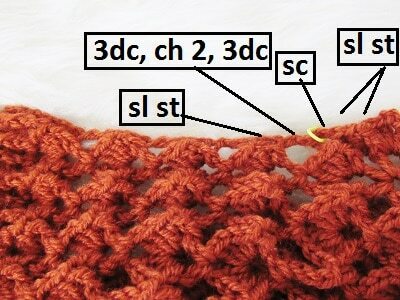 Hi Colleen, I have explained how to work the shell under stitch explanation at the top of the pattern. That note was only meant for people who have worked my Falling Petals Afghan and Rose Petals scarf. In those patterns, shell was just (3 dc, ch 2, 3dc). Thank you…I’ll certainly let you know!!! Thank you for your beautiful patterns – we are truly lucky there are talented and generous people like you around. Ive never crocheted anything more than a granny square, but have been practicing the herringbone stitch to try the gorgeous asymetrical one……..thanks again for sharing your work. Hi Cat, thank you for your kind words. I am really glad you like my patterns.